Since I made a plethora of tacos last night...we'll be chowing some leftovers for dinner. That still left lunch to be made. Jim voted for pizza. I refuse to pay more than $2 for a frozen pizza. Joseph's Marketplace sometimes has their kitchen's frozen pizzas 6/$10 and when they do? I stock up. Aldi also has a mean frozen pizza that is very similar to a Tombstone with sauce that tastes more like a Jack's. They are regularly priced at $1.99 everyday with NO COUPONS or SALES! Stop buying Boboli crusts for $5 each. Such a rip off! 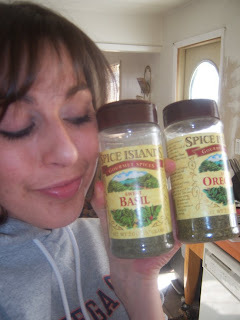 If you must start with a "blank slate" for your pizza, check out Trader Joe's. They have bags of pizza dough in their refrigerator case for about $1 each. They freeze fantastically & make awesome calzones and foccacia bread. 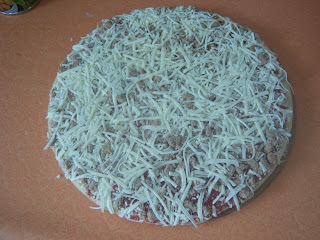 I always doctor up my frozen pizzas and they ALWAYS taste better than a takeout pizza for 10 times the price! 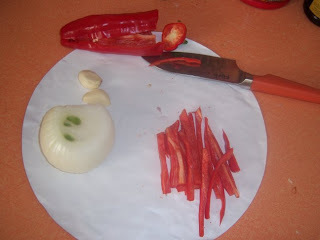 This one was a sausage pizza, so I sliced up some sweet red pepper (Aldi and Sam's Club both carry Ancient Sweet Peppers), sweet onion & garlic. I always use the paper from the pizza so I don't dirty up a cutting board or paper plate. 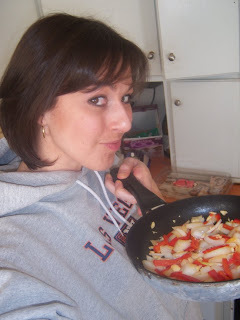 The key to not having a watery pizza is cooking the veggies before adding them. 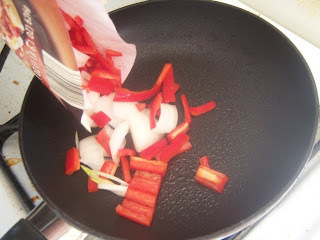 The pizza is already partially cooked, so you should partially cook your veggies too. 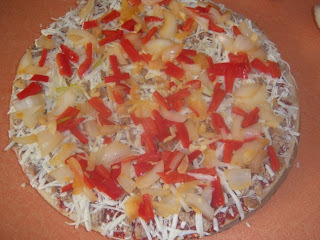 This gets rid of the crunchy "raw" taste & eliminates the sogginess in the middle of the pizza. 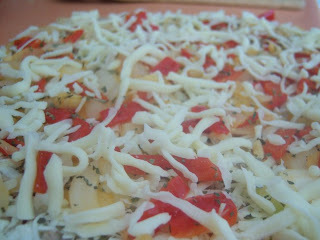 I always add oregano & basil and a little extra cheese. 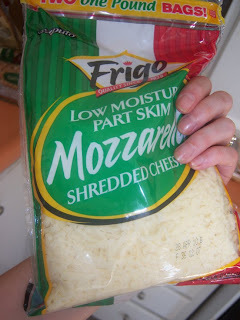 I get the shredded mozzarella at Sam's Club - 2 pounds is usually around $5, sometimes less. The average store has an 8 oz block of chunk cheese for around $2, so you are saving $3 and it's already pre-shredded! Add a few extra minutes onto the cooking time & crank the oven on "broil" for the last few minutes to get a nice golden top. 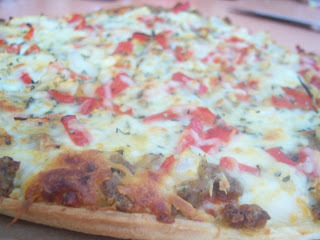 I can tell you, this pizza was da bomb! Annnnnd it only cost about $1 per person. Waaaay cheaper and tastier than anything you can get out for lunch.